According to their pamphlet it is a very environmentally friendly process because no harm is done to the tree. They remove the old shaggy bark from the outside of the tree and can harvest the bark from trees of all ages. Their product does not contain any chemicals or artificial colors. The resulting syrup is a little less sweet than maple syrup, but has a little smokey flavor to it. 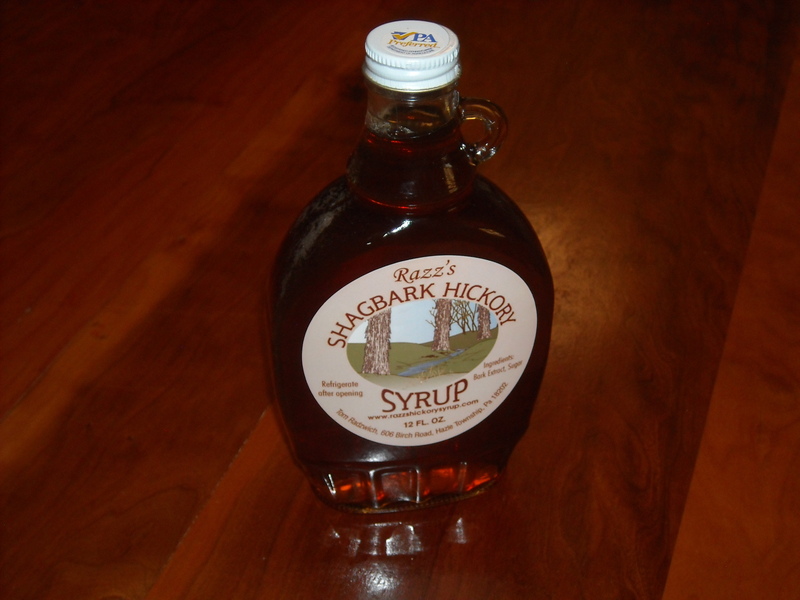 Like maple syrup it can be used to sweeten many things and in a lot of recipes. This is one of those products that's just amazing. It's simple, but good. If you are interested in learning more about the product you can check out their website: www.razzshickorysyrup.com. They have a lot of great recipes on their site. Very interesting! I went to a maple syrup demo a few years back and they also made syrup from tapping box elder.